Fish with an experienced local guide. Fly fishing for Rainbow and Brown Trout. Fish 1 day back country and 1 day on the Waiau river using a jet boat. We will provide any fishing tackle required. Plus arrange for fishing licenses if required. We cater for all levels of ability and experience and we promote "Catch and Release." Fly Fishing package reservations can be made atour secure booking engine. Includes accommodation, all meals, fishing guide, any fishing tackle required. Fishing licenses $25 per day extra. We do not include these in the rate as the vast majority of people already have a fishing license prior to arriving at Fiordland Lodge having fished other areas of New Zealand. Prices valid until May 31st 2018. Fiordland Lodge provides one of New Zealand's finest stays at a price much less than the top high end properties. 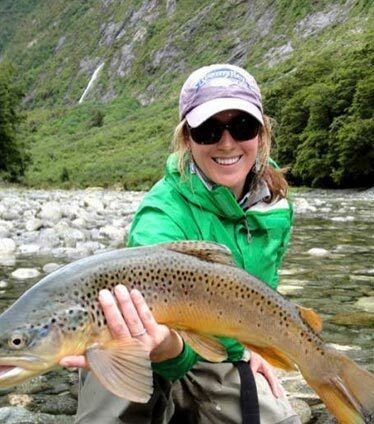 Whether you're interest is fly fishing the varied waters in the area or other Fiordland activities, it is the top headquarters for Fiordland adventures. Personally, we've enjoyed Fiordland Lodge for many years and, additionally, have sent many satisfied clients to partakein the Fiorland Lodge experience.